So this is what happens when the Big Three finally play together in a month, huh? A 95-93 loss to the Philadelphia 76ers, including a blown 14-point second-half lead, their second game in a row where they blew a fourth quarter lead, and a terrible play call in the game’s final seconds. Philadelphia’s Andre Iguodala throws down an alley-oop pass for a dunk over Yao Wednesday night. Houston’s defense this year has been nowhere near its norm, which is a different topic for another day. Click here for more photos from the game. You would think after getting embarrassed in New York by blowing a 4th quarter lead to an inferior team that the Rockets would have had the motivation to take care of business and make a statement that the Knick game was a one-game lapse. I was nervous about this game against the Sixers for days, with all of the Big Three playing or not, because Philadelphia is very athletic and they had defeated the Rockets 3 straight times heading into Wednesday’s game. Plus, they were going to have Elton Brand in this game, a force they didn’t have in their victory against Houston on January 6th. Surprisingly, Tracy McGrady was decent, especially in the third quarter when he scored 13 points, taking it to the rack more often in this game than I’ve seen in a long time. But he missed all four of his shot attempts in the 4th quarter, including a terrible play in the game’s final seconds that could have tied or won it. The Rockets tried to run a slow-developing pick-and-roll between Yao and McGrady, with both of them starting way out high, but that was stupid because there wasn’t enough time for Yao to start so far away from the basket, then get position in the paint down low for a high percentage shot, all in 5 seconds before time expired. Second, McGrady was very slow in starting the play. It’s almost like the Rockets DESIGNED this play for McGrady to take a low-percentage 3-pointer, and not find Yao instead. The result was predictable – McGrady’s shot was partially blocked by Samuel Dalembert, who switched over to guarding McGrady once he sensed he was going to jack up a low-percentage three. After the Rockets debacle of a defense let the Philadelphia 76ers slice their way to the rack all night long Tuesday night for easy baskets, I bet there will plenty of fans calling Houston sports talk shows Wednesday morning wondering if Jeff Van Gundy can come back to the Rockets. Houston gave up 52 points in the paint to Philadelphia while allowing 56.2% shooting on their way to a 104-96 loss, their third in a row and their fifth loss in a row on the road. Yao Ming sits on the bench exhausted as the 76ers offense kept him running all night long. Click here for more game photos. Last year when the Rockets played such great defense, some people thought it was because Rick Adelman’s coaching staff had done something exceptional that he wasn’t very well known for doing – having a great defensive team. Other people thought it was a carryover of the defensive attitude they had the prior season during the JVG era. I know Shane Battier is out and he’s a good defensive player, as well as Ron Artest, and their absence makes playing great defense that much harder. But I think it’s becoming clear that last year was a fluke for an Adelman-coached team to play such great D, and that it must have been JVGs prior emphasis that had made them so great. On Tuesday there was just too much breaking down on defensive assignments to allow so many easy buckets like the Rockets gave up. The JVG attitude has worn off lately. (This short post comes from a friend who has offered to help clean it up to make sense of my clouded thinking tonight): I have awoken from a long rest from surgery today to hear the Rockets blew another 4th quarter lead, this time to the 76ers on Tuesday. Knowing many of you probably are angry enough to provide some scathing comments about the Rockets, I’ll rely on you guys to provide all the analysis if you wish by clicking on the comments link below. I’ll have a friend check periodically to approve them. Let ‘er rip! Yao Ming misses a dunk against Philadelphia in a game that was a disaster for the Rockets. Yao only made 3-of-11 shots and scored 12 points in 33 minutes before all the starters were pulled after having fallen behind by 20+ points in the second half. I was going to write a long post about all the things the Rockets did wrong as they fell behind by double-digits in Philadelphia Monday night. But then it just kept getting worse and worse, and I couldn’t keep up with documenting their poor play as the Rockets fell behind by 31 points. When it became garbage time, Rick “Idle-man” (as aptly named by reader “Shawn”) finally put his subs in the game for good because he had no choice since his starters sucked so bad. And lo and behold, the unit of Luis Scola, Luther Head, Bonzi Wells, Kirk Snyder and Mike James actually made it interesting by pulling to within 12 points with a few minutes left, but they couldn’t get a miracle win. But at least they showed they have some players who can score in a 100-88 loss. I am not going to cite any statistics for any player because those numbers don’t mean anything in a game like this one. The starters don’t deserve to have their numbers mentioned, and the subs got moist of their points in garbage time when the game was out-of-hand and there was really nothing to lose. If there is anything to be learned from this game, it’s that Rick Idle-man needs to show some balls and START this same bench unit against Detroit on Wednesday night — at least for that game — and sit Tracy McGrady, Yao, Chuck Hayes, Shane Battier and Steve Francis. That will send a signal that their poor play is not going to cut it. The reserve unit deserves a chance to show what they can do when they start a game. If they implode, so be it. At least Idle-man would have rewarded “giving a damn” with playing time. Yao Ming and Tracy McGrady enjoy some well-deserved time on the bench during an impressive 124-74 blowout of the Philadelphia 76ers on Sunday. Yao had another double-double (24 points, 13 boards), and T-Mac had 21 points and 8 assists. Click here for more photos from the game. There is absolutely nothing I can complain about in Houston’s 50-point whipping of the Philadelphia 76ers. If anything, it brings more attention around the league – including in Dallas and Phoenix — that the Rockets will be a force to be reckoned with come playoff time. Philadelphia has been no slouch lately. They had won 8 of their last 9 games at home, including victories over the Jazz, the Lakers, Sonics, Nets, and Suns. So you have to give Rockets to the credit for beating a respectable team of late. It was the Rockets’ largest road victory and their second-largest margin of victory, with a 52-point victory coming in 1978. Check out these other unbelievable numbers: a 54-36 rebounding advantage, a 54-8 advantage of points in the paint, a 29-10 difference in assists, an 11-4 advantage in 3-pointers, and only 7 turnovers for the Rockets. What’s interesting is that you would expect a player like Yao or T-Mac to have monster numbers, like 35 points or more. Not so. 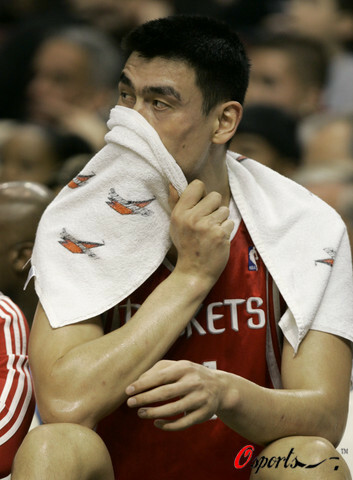 Yao had a respectable 24 points on 10-of-18 shooting, and 10 boards in just 26 minutes. T-Mac “only” had 21 points on 7-of-17 shooting in 28 minutes. The key was that the Rockets role players chipped in with solid contributions across the board. Luther Head had 13 points, Rafer Alston had 9, Juwan Howard had 11 points and 10 boards, and Chuck Hayes had 12 points and 13 boards. The Rockets continue to roll, beating the 76ers 105-84 in a game that wasn’t that close Monday night. At one point the Rockets held a 41-point lead, which the reserves blew in the fourth quarter, getting outscored 33-16. Van Gundy wasn’t happy about how the bench played after the game was a moot point. But he lightened up a bit after that. Indeed, the starters played exceptional. 31 assists as a team. T-Mac hitting 8-of-14 shots for 25 points. McGrady easily could have scored more, but he sat out his second straight 4th quarter. It’s nice to see him get rest when it isn’t induced by injury. Juwan Howard (20 points on 10-of-15 shooting) hit jumper after jumper from the top of the key that he seems to make so incredibly well. It just reminds me how much damage he could have done to the Mavericks a couple of seasons ago during that Mavs-Rockets playoff series when he was sidelined because of a heart issue. If he had been able to play and hit those shots, that series could have had a completely different outcome. Rafer Alston finally had 50% shooting! 5-of-10 for 12 points, plus nine dimes. If he continues to shoot like that, look out league! The best compliment came from 76er Andre Miller after the game. About the Rockets’ chances come playoff time. Allen Iverson drives past Yao on Wednesday night in a game where A.I. scored 40 points and dished out 10 assists to eclipse Yao’s 22 points and 13 rebounds. The 76ers beat the Rockets 106-101 in Houston. To see more photos from the game, click here. WEDNESDAY, 3/1/06 – The Rockets lost a tough one Wednesday night. Yes, the 76ers have a better record than the Rockets, but Houston has always matched up well against Philadelphia. And with a playoff berth at stake, the Rockets don’t have much room for error with 24 games remaining until the post-season starts. Allen Iverson (40 points, 10 assists) was incredible, putting his team on his back in the fourth quarter to score 12 points (4-of-6 shooting, 4-of-4 from the line). And Kyle Korver hit 3-of-4 from three-point land in the fourth quarter. Result: a disappointing 106-101 Houston loss. It’s hard to believe this was the same 76er team that didn’t make a field goal in 19 minutes of play in their last game in Philly a few weeks ago. With Houston’s defense breaking down at the most inopportune time, Iverson and Korver could hardly miss down the stretch while T-Mac (25 points) and Yao (22 points and 13 rebounds) missed a few too many shots, making only 4-of-11 collectively as the Rockets’ lead withered away. The Rockets were looking good with an 11-point lead with 5:00 minutes remaining in the third quarter, and held a 77-73 lead heading into the fourth, thanks to T-Mac scoring 12 points of his own in the third. However, Houston’s main failure in this game occurred with their guards’ shooting. Rafer Alston shot a paltry 5-of-15, David Wesley was only 3-of-11 — falling in love too much with the three-pointer (1-of-8) — and Keith Bogans was 2-of-6. It was ironic this kind of shooting occurred on the same day the Rockets waived Jon Barry. I understand the Rockets were doing Barry a favor by giving him the opportunity to sign with a team so he could have a chance to play in this year’s playoffs. But it’s hard to stomach the fact that Barry could have contributed something from the outside in this game and the rest of the season. On the bright side, Chuck Hayes was awesome, making all five of his field goal attempts, scoring 11 points and grabbing four boards in only 14 minutes. The other good thing from Wednesday night is that the Lakers were upset by the Portland Trailblazers , so the Rockets are still only 4 games back in their quest for the final playoff spot in the West. It doesn’t get any easier for the Rockets’ in their next game when they play the Northwest division leading Denver Nuggets (31-27). 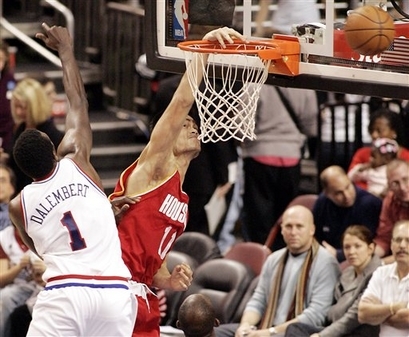 Yao scores two of his 27 points Monday night over Philadelphia’s Samuel Dalembert. The Rockets won their fourth straigt game, beating the 76ers 87-81. To see more photos from the game, click here. MONDAY, 2/6/06 – Who would have thought the Rockets could win with T-Mac scoring only 13 points? That’s what happened Monday night in a game which Yao dominated, tallying a double-double (27 points, 12 rebounds), and their defense holding the Philadelphia 76ers without a bucket for 15 straight minutes and 19 straight shots in the second half. Look out. The Rockets are on a 4-game winning streak, and are fun to watch again! In addition to the 76ers drought in the second half, they only shot 18% in the first half, scoring only 9 points in the second quarter. They also had 14 turnovers in the first half, finishing with 24 TO’s compared to Houston’s 13. Although Yao scored 27, he only made 9-of-21 from the floor. The key was his shooting 9-of-9 from the free throw line. Props go to Rafer Alston, who finally shot well from the field to add to his usual decent assist totals. After hitting only 1-of-16 three-pointers in his past four games, Alston finally found his range and hit 5-of-8 treys Monday night, scored 19 in addition to his 8 assists. He also played pretty good defense on Allen Iverson. With T-Mac only making 5-of-19 shots, we can say that without Alston’s contribution (and of course Yao’s), the Rockets probably would have lost this game. That’s a switch. It didn’t hurt that Philadelphia struggled from the floor, making only 33% of their shots. It’s very reminiscent of Houston’s bad shooting when T-Mac and Yao were both out of the lineup. But hey, it happens, and the Rockets will take it. I am now betting that T-Mac will have a monster game against the Lakers on Wednesday night because rarely does he have more than a couple of bad games in a row, and it’s T-Mac’s turn to take over for Yao as part of their “one-two” punch while Yao has just a so-so game statistically. And you can bet T-Mac will be pumped to play against his scoring rival, Kobe Bryant. TUESDAY, 10/11/05 – Even though Tuesday was the first game of the preseason for the Rockets, it was great to see them in action again. A lot of the new guys surprised me by playing well for the first preseason game, this one played against the 76ers in Philadelphia. Beyond playing well, a bonus was that the Rockets won the thing, 105-91. Watching the game on television, it was difficult for me to tell the difference among all the new guards, like Derek Anderson, Rafer Alston, Keith Langford, and rookie Luther Head. I’m sure it will take a couple of games to get used to them all. I really liked what I saw. There was a lot more passing (26 assists) and ball movement, which is surprising considering it’s so early in the preseason. We’ll see if they keep doing this and accomplish my desired goal of sharing the ball this season like the Spurs. Allen Iverson tries to avoid the Great Wall in Philadelphia on Wednesday as the Rockets beat the 76ers going away 118-95. The Rockets had balanced scoring with seven players in double figures, Yao scored 12 points, grabbed 5 rebounds, and had two blocks. For more photos from the game, click here. WEDNESDAY, 2/2/05 – Although they were on the East Coast in Philadelphia, the Rockets got a little bit of ‘Sacramento’ in them on Wednesday night. Like the Kings who have shown the Rockets the past few years what good things can happen if you share the basketball and shoot with accuracy, the Rockets had 35 assists on 41 field goals and nailed 14-of-25 three-pointers (56%) to defeat the 76ers 118-95. The first quarter was a shootout. Allen Iverson torched the Rockets with 15 points and the 76ers scored on at least four alley-oop plays. The good news is that after the Rockets hit only 2-of-6 to start the game, the Rockets kept up by hitting six shots in a row. Yao scored 3 buckets in that run helped by great dishes from his teammates, and capped the scoring run with a bib throw-down over a mismatched Kyle Korver on a defensive switch. Incredibly, the Rockets had 9 assists to go with their first 8 buckets. The Rockets cooled off the rest of the quarter, hitting 3-of-9 the rest of the way. They still managed to shoot 11-of-21 for a 52%, and T-Mac led the Rockets in scoring with 13 points on 4-of-8 shooting. But Philadelphia was a bit better, hitting 61% of their shots and holding a 33-31 lead at the end of the first quarter. At the beginning of the second quarter, T-Mac hit two consecutive 3-pointers from the top of the arc, along with a long two-pointer near the top of the key. So just 3 minutes into the second quarter after his barrage of long jumpers, he had 21 points to open up a 44-35 lead for the Rockets. That’s when the fireworks really started for the Rockets, with David Wesley, Jon Barry and Scott Padgett hitting three-pointers. Bob Sura then scored on a fastbreak layup, was fouled, and converted the free throw. He then made another shot, and Wesley came back with another three-pointer, and the Rockets held a 62-49 lead. If you can’t tell, I was ecstatic to see so much scoring come so quickly for the Rockets, thanks to hitting 6-of-10 three-pointer in the second quarter to outscore the Sixers 32-22 and hold an 8-point lead at halftime, 63-55. Houston shot a scorching 56%, out-rebounded Philly 23-15, and had an amazing 17 assists. If Philadelphia hadn’t outscored Houston 32-16 in the paint and stole the ball 8 times to Houston’s one steal, it would have been over. At the start of the second half, the Rockets kept pouring it on by going on a 19-6 run thanks to the Sacramento Kings-like passing and long bombs, taking an 82-61 lead. Meanwhile, Iverson only scored three points since his first quarter 15-point outburst. The Sixers only hit 4-of-16 shots in the quarter while the Rockets outscored them 25-16 to hold a 17-point lead after the third quarter, 88-71. It helped that Yao and Dikembe Mutombo were altering shots down low. The Rockets coasted in the fourth quarter, never threatened to lose the lead. To show just how things were going their way, Scott Padgett from underneath the basket threw a long pass out to Jon Barry behind the three-point line. Barry then faked a hard pass like he was going to pass the ball, which got Iverson to bite on the fake embarrassingly so that he was over 6 feet out of position. Standing all by himself with Iverson out of the picture, Barry launched a trey and buried it! That put the Rockets ahead 99-80. With the big lead, Jeff Van Gundy rested many of his starters like Yao, Wesley and Juwan Howard. In the fourth, super subs like Barry scored 6, Padgett scored 10, and Dikembe scored 8 to seal a 118-105 victory. When the dust cleared, T-Mac scored 34 points on 10-of-21, and made 5-of-10 three-pointers. Howard scored 14 points and had a surprising 13 rebounds. With the easy victory, Yao got some rest playing only 27 minutes and scoring 12 points, grabbing 5 rebounds and blocking two shots. Most staggering: the Rockets’ 35 assists on 41 field goals. What got into them all of a sudden? Whatever it was, I hope they keep it rolling. The Rockets are now 26-21 and 12-11 on the road and face the struggling Minnesota Timberwolves (24-21) on Friday night. You are currently browsing the archives for the vs. Philadelphia category.